Gutters play an essential role in keep your home protected and preserving your roof's durability. Do you need new gutters in Massachusetts? Are your current gutters in good shape but not draining properly? Want to enhance your home with copper gutters? Contact GF Sprague for gutter installation, repair, or replacement on your home or business. For over 45 years we have been protecting structures from water damage with quality roofing and gutter solutions. Our goal is to help you protect your property by always providing you with the right service at the right price. We offer free estimates on all of our gutter installation services in Newton, Needham, Wellesley and the nearby areas. Call us at 1-781-209-6791 or click below to get started! This homeowner called us to take a look at their gutters which were not draining properly and water was running right off the roof rather than through the gutters. Our inspection showed that the gutters were damaged and pitched incorrectly, so new gutters were the best option. This homeowner decided they liked the coated copper gutter option, and the new gutters came out looking great. This customer was having issues with the existing gutters leaking profusely and with water running behind them rather than through them. 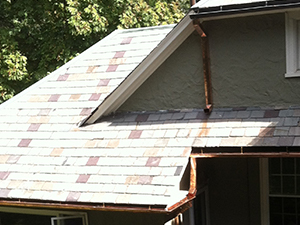 When deciding what type of gutters would work best when replacing the existing system, our certified expert decided that lead coated copper would be the best option. This customer had been experiencing issues with their gutters not working properly for years before they decided to call us. Not only do the new copper gutters give the property a great new look, but they also ensure water flows off the roof properly. For this job we replaced the old and damaged aluminum gutters with copper gutters. Not only do the new gutters give the house an updated look, but they will work much more effectively. See more pictures from this job in our photo gallery! These homeowners wanted to update their gutters and also add curb appeal to their home. We hand fabricated these copper gutters in our modern sheet metal shop.Not only will these new gutters function well, but they will last for over 50 years, as well as compliment the slate roof. Another classic example of GF Sprague's custom copper gutters. Gutters aren't just for show. They serve the very important function of preventing water that falls off the roof from pooling in one area. Downspouts further divert this water away from the base of the house, protecting foundations, siding, adjacent landscaping, decking, patios, sidewalks, and driveways from excess water. A build-up of water or a constant flow to these areas can lead to structural instability, seepage in the basement, or even cracks in concrete. The best way to combat these risks is to stop the damage before it starts through the use of gutters. Proper gutter installation is essential for the gutters to work properly, which is why you should trust the job to licensed professionals like GF Sprague. Years of installing gutters have honed our team's skills so you can be assured of getting the job done right the first time. Even with perfect installation, you will need periodic gutter repair or maintenance. This is particularly true if your home is prone to ice dams. Ice dams can damage gutters, adjust their slope, or even force them away from the house. If you have ice dams in winter, you should have the gutters in that area inspected each spring to make sure they are still performing properly. Severely damaged gutters could even redirect water towards the eaves or fascia of the home, which is a surefire way to sustain water damage. Inspection: Contact us for an annual inspection of your gutter system. We'll look for leaks and cracks, check the slope, and make sure the gutters and downspouts are free of debris that could cause clogs. Adjustment: A gutter that does not drain properly doesn't work. If you've got standing water in your gutters or water that flows over the edge of the gutter, give us a call. We'll adjust the slope of the gutter, reposition it if necessary, and check the downspouts to make sure water is draining away from the home. Replacement: Gutters wear out. They break. They may need replacement if you repaint or re-side your home. GF Sprague offers complete gutter replacement using only top-quality materials. Gutter Cover Systems: Never spend another spring or fall day cleaning out your gutters. A gutter cover system will prevent leaves, sticks, and debris from falling into the gutters so you can spend more time enjoying the change of seasons. Custom Copper Gutters and Downspouts: Add a touch of elegance to your home with our custom copper gutters and downspouts. Copper gutters are hands-down the best gutter product available, but they require special expertise for proper installation. It's best to trust this type of job to professionals who have significant copper-handling experience like GF Sprague. Aluminum Gutters: The most common type of gutter today, aluminum gutters are strong and durable, yet lightweight. These heavy-duty gutters are available in nearly every color imaginable, do not rust, and come in different thicknesses. Copper Gutters: Essential for classic restorations, copper gutters are available in various weights, do not require painting, and won't mildew. They do require specialists for proper installation and maintenance, however. Galvanized Steel Gutters: Strong and durable, but heavy, galvanized steel gutters are best installed by a pro to ensure proper drainage and no standing water, which can lead to rust. Galvanized steel can be painted to match any home color and will withstand ladders, fallen branches, snow, and ice better than aluminum. Vinyl and Plastic Gutters: Easily installed, vinyl and plastic gutters are the most cost-effective choice and popular with Do-It-Yourselfers. GF Sprague's vinyl gutters are of higher quality than what can be found in retail stores, making them exceptionally durable and maintenance free. Wood Gutters: Exceptionally rare, but essential for period homes, wooden gutters require special expertise to maintain, repair, and replace that only the professionals at GF Sprague can offer. These gutters are as much an architectural statement as they are a water-diverting tool, both effective and beautiful. Zinc Gutters: Similar in form, function, and quality to copper gutters, zinc gutters are extremely long-lasting, tough, and require virtually no maintenance once they've been installed. Zinc interacts with the elements to form a natural protection that discourages corrosion and weathers to a bluish-grey. GF Sprague provides custom gutter solutions year-round, so your home is always protected from water. We are a locally-owned and operated business and are experts at installing gutters on homes and businesses that can stand up to the local weather, no matter the season. Call us today for a free estimate in Wellesley, Needham, Newton, Chestnut Hill, Weston, Boston, Brookline, Quincy, Watertown, Cambridge and throughout the surrounding areas.